So, here is the information that I know you need before this weekend’s Unique Boutique. Many thanks to Kathy Edwards for all of her hard work. Be there or be square! Click on the link below to see lots more photos and details! 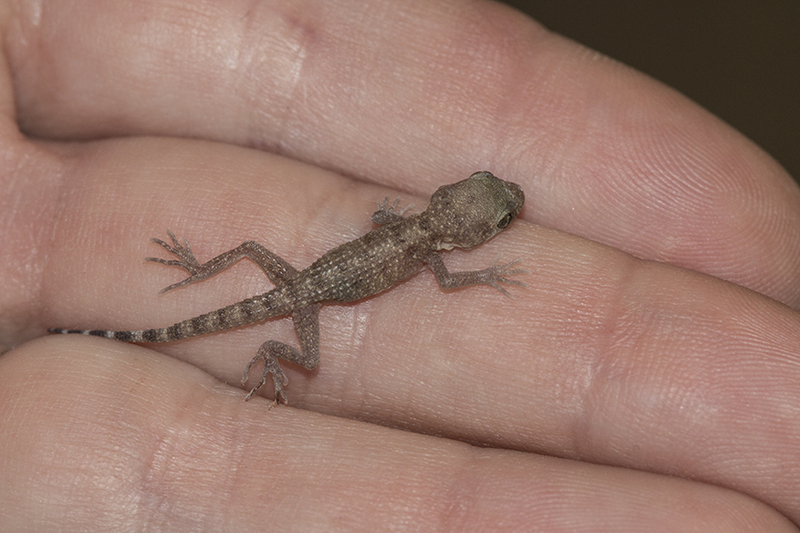 A lot of you know I am an animal lover and a volunteer at Liberty Wildlife. As a member of the fundraising committee (“Guardians”) I am proud to support our1st Annual Unique Boutique Fundraiser. All proceeds will benefit Liberty Wildlife! CHECK BACK OFTEN FOR MORE DETAILS & PICTURES ! Thank you for your continued loyalty & support. The intake total for the year is now up to 7591. As the intake rate decreases, our focus takes a seasonal bend towards education. 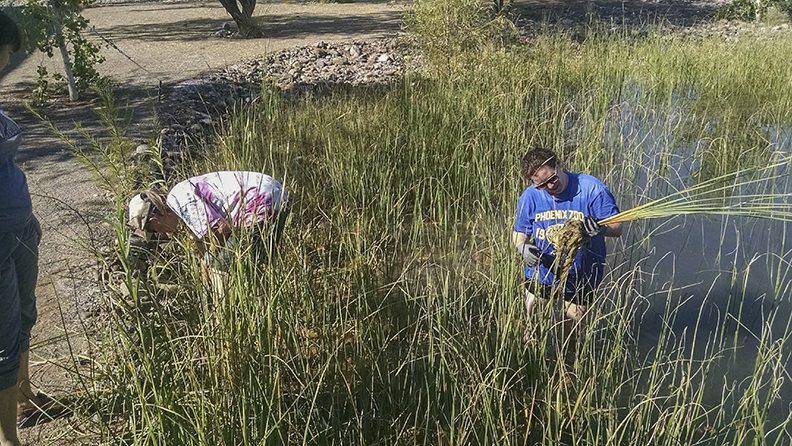 A number of Ed functions are scheduled each week, hopefully to both increase public appreciation for the wildlife in Arizona, and to gain exposure for the Rob and Melani Walton Campus of Liberty Wildlife and all we offer to the community. 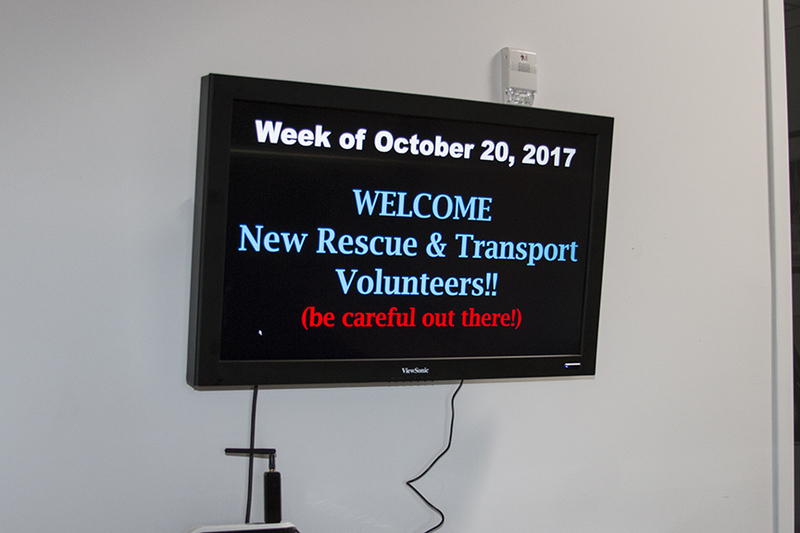 Our new facility provides so much more than a place to drop off injured pigeons but we need to get the word out that we’re here! 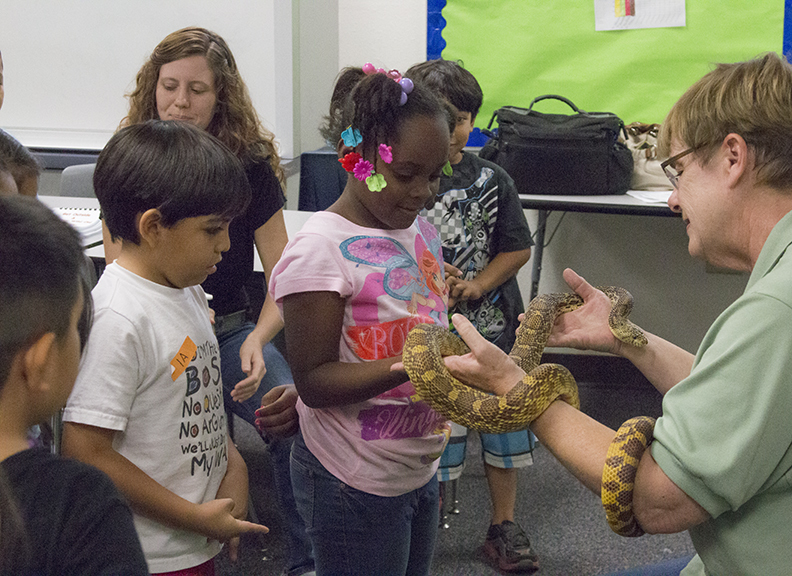 To that end, several fun, educational events took place recently with more in the offing. 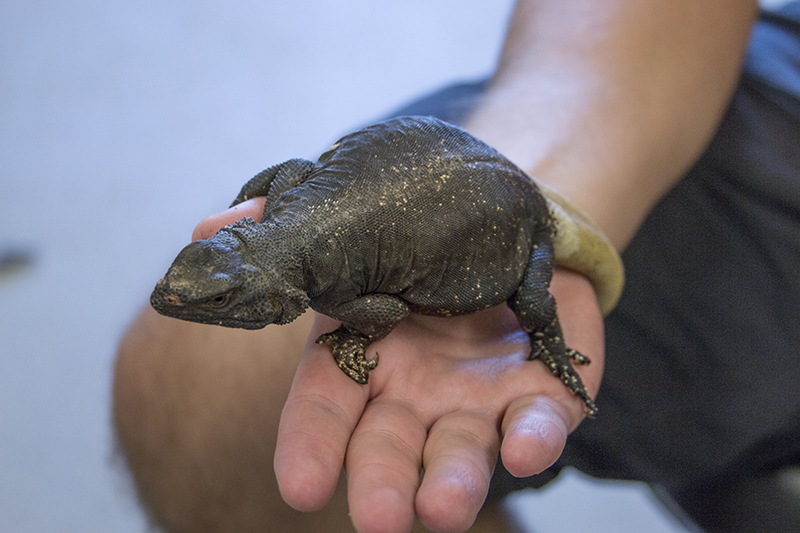 Along with the emphasis on education, providing first class medical care for injured and orphaned native Arizona wildlife remains our main function, even in the slow time of the year. This is the season when we see a few visitors that only turn up when the flocks of migratory birds pass through our state. When they run into problems, we’re there to give whatever assistance we can before releasing them to return to their journey. 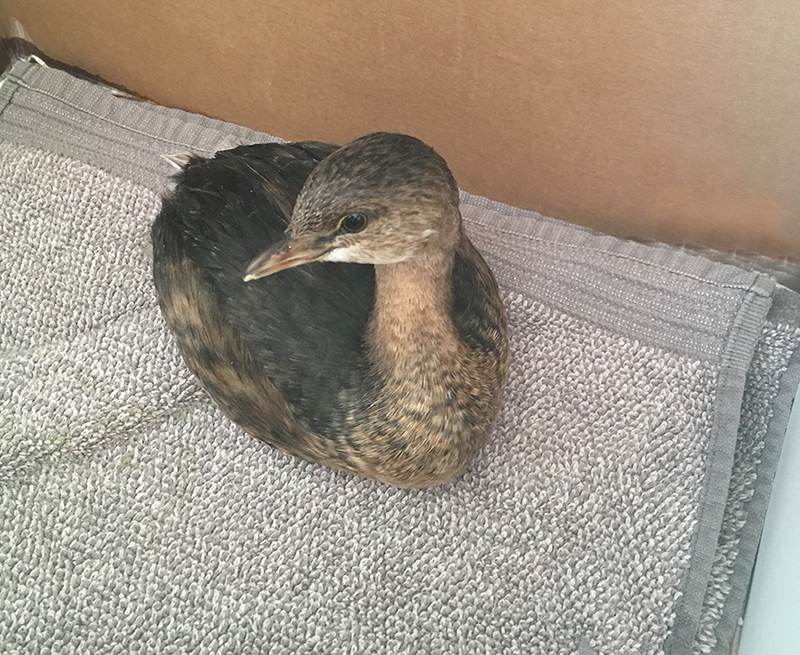 Each year, we take in several water fowl who are not terribly injured, but they have chosen to land in an inappropriate location, namely not in water. Certain species have a physical architecture that makes it impossible for them to motivate on land. Their legs are so far aft of their center of gravity that they can only move or take-off on water. Once in a while they will land on a street or something that looks a bit like water and then they are stuck until they somehow get back to a lake or pond. 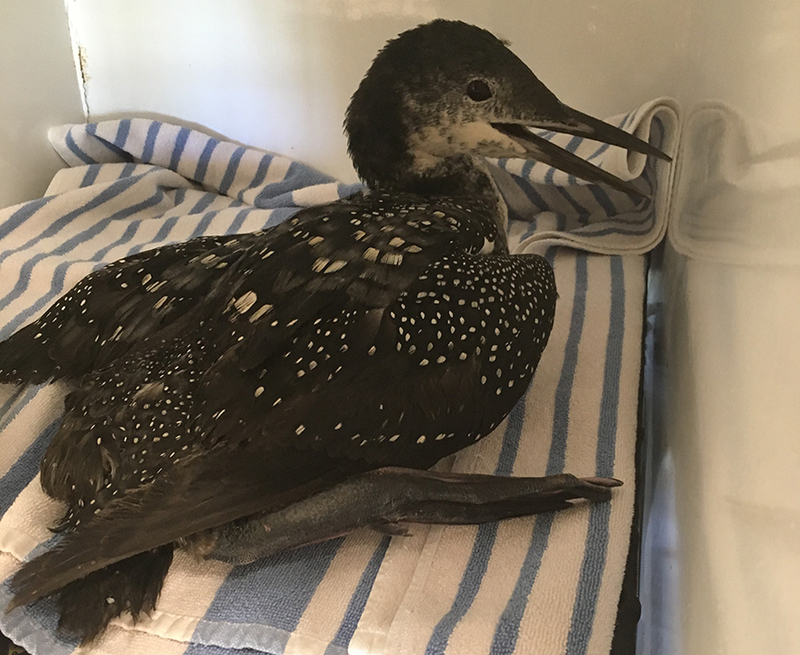 Loons and their smaller cousins, grebes, will show up when people find them on the ground and they tell us, “He can’t fly!” which is not entirely true. Many times all we have to do is get them back to a big enough lake and they are released and do fine. This year we took in 4 loons and a couple of grebes, probably on migratory flights. 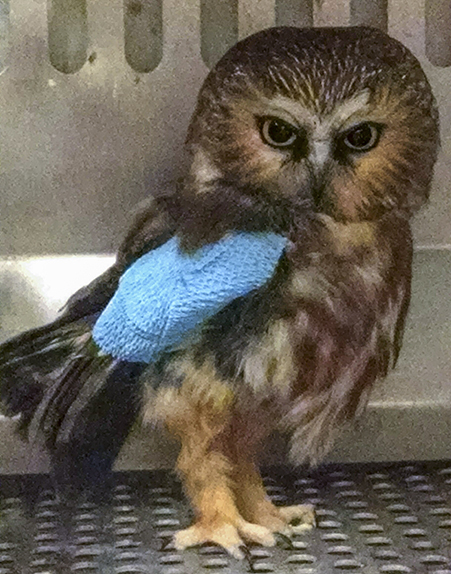 Two more migrants that came to us for help recently are this northern saw-whet owl and the hermit thrush. The saw-whet, one of two we are caring for right now, is a common owl in north American forests. A tiny owl with a catlike face, oversized head, and bright yellow eyes, the Northern Saw-whet Owl is highly nocturnal and seldom seen. Their high-pitched too-too-too call is a common evening sound in evergreen mountain forests from January through May. The Hermit Thrush lurks in the understories of far northern forests in summer and is a frequent winter companion across much of the country. It forages on the forest floor by rummaging through leaf litter or seizing insects with its bill. 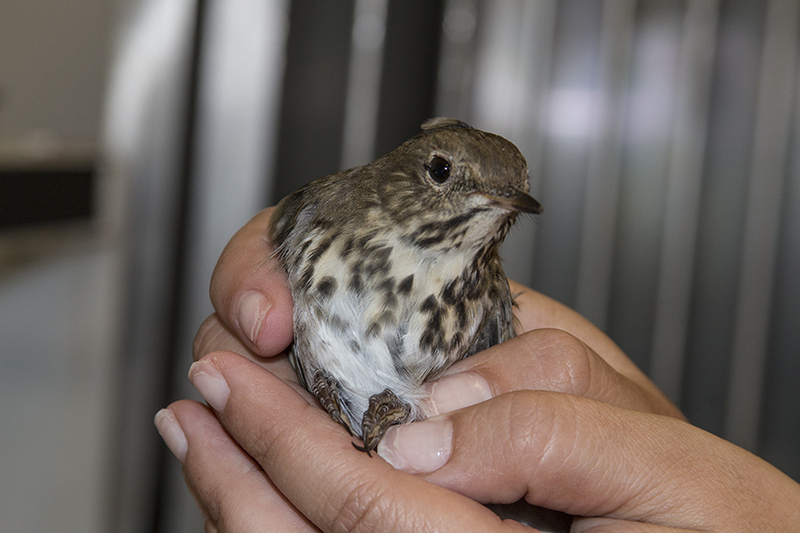 Both the saw-whet and the hermit thrush were almost certainly on migratory journeys when they ran into trouble and came to Liberty for help. And finally, Evelyn is one of our Interpretive Guides on Wednesday. 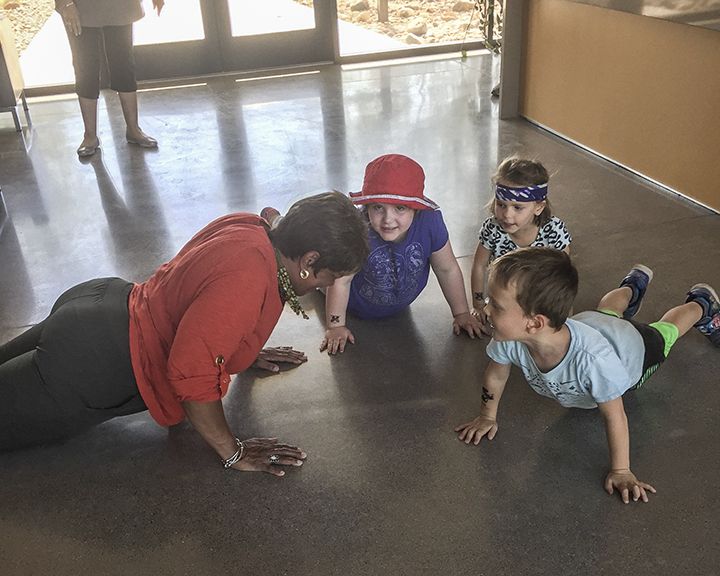 We had a few children come for open hours and see just got really into playing with them … Not sure why they all decided to plank though, but kids having fun while learning about nature is one of our goals. 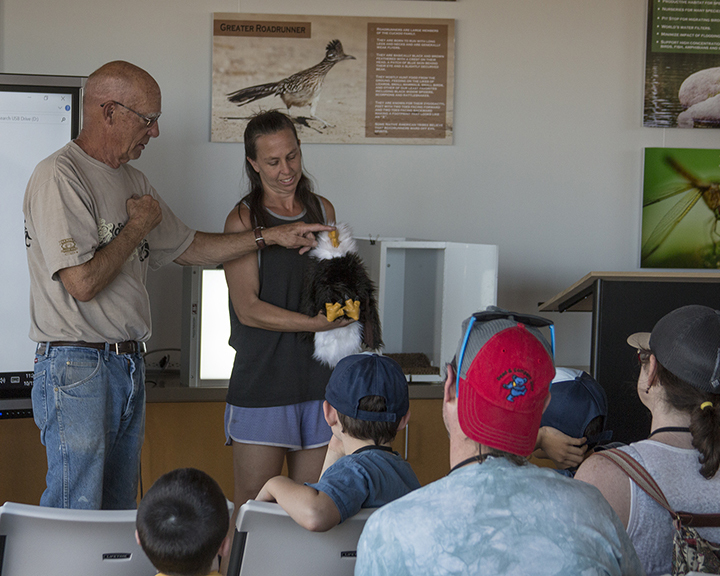 One of the coolest features of the new Rob and Melani Walton Campus of Liberty Wildlife is the “Big classroom” near the amphitheater. 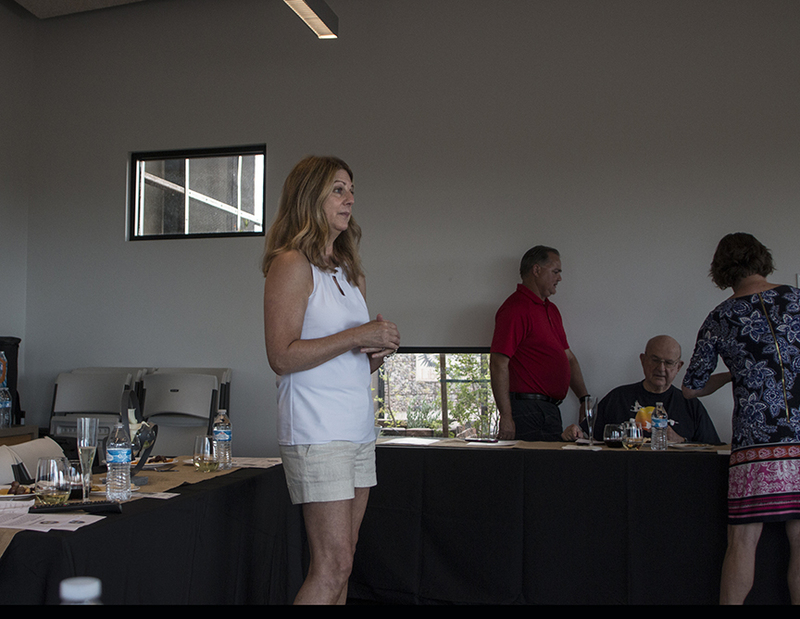 This large room with multiple windows and doors, and equipped with 75″ touch-screen monitors and moveable tables, is useful in many ways. 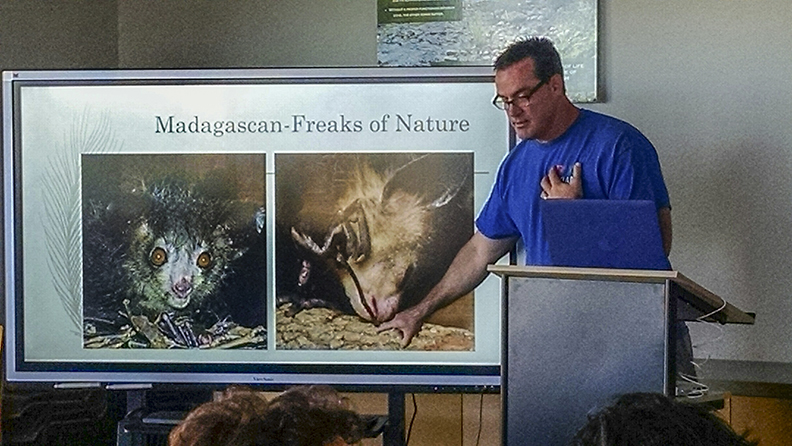 Recently Dr. Todd Driggers gave a presentation on his trip to Madagascar and pointed out some of the CREEPY CREATURES he saw there (part of our Halloween weekend festivities). 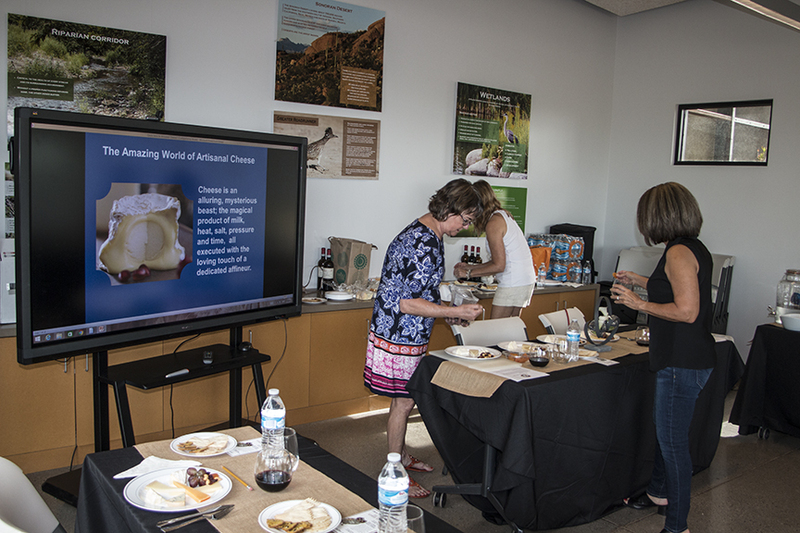 On another day, Laura and Dr. Ingram put on a program for the public which they called “Stump the vet!” Then on Sunday afternoon, we held a wine and cheese tasting event in the classroom which was extremely interesting – and delicious! 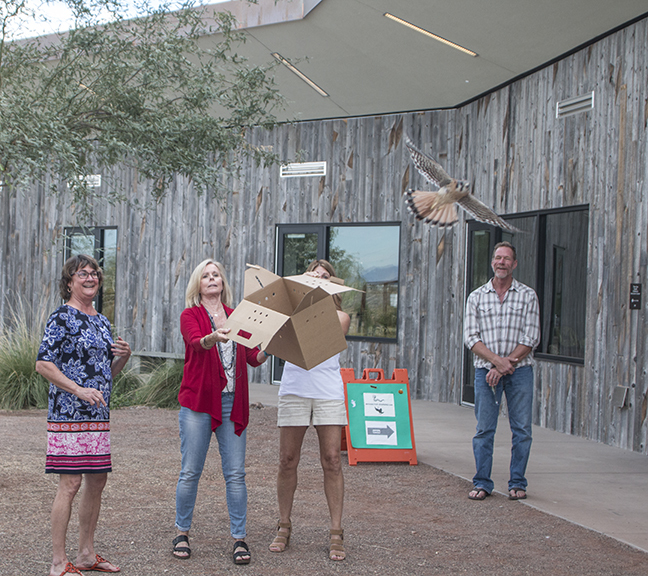 This event included releasing two rehabilitated kestrels that flew around thew wetlands for several minutes after leaving their carrier. As Jan has announced, we lost two more of our older and beloved education animals. 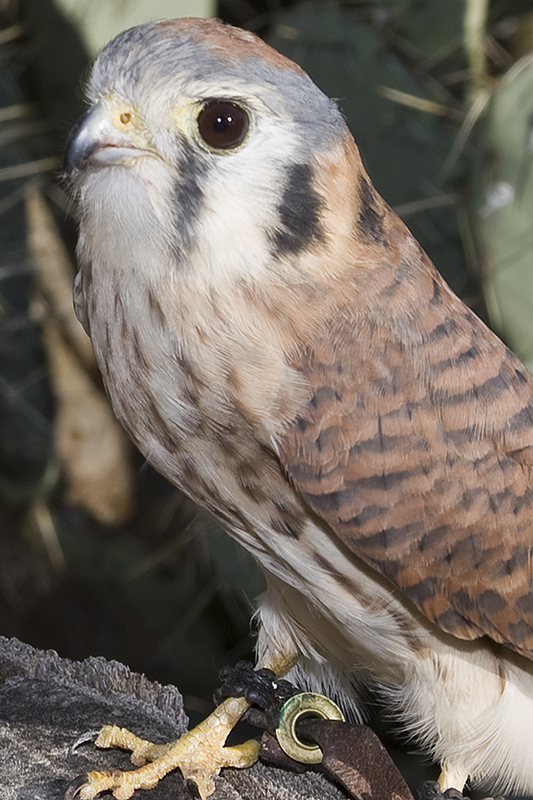 Yang, a beautiful gopher snake, and Lucilla, a gorgeous female kestrel, both of which had been with us for many years, died of complications of advanced age. Both of these animals starred on the Education team for almost thirty years combined. There’s no telling how many kids (and adults!) these two quiet educators experienced and influenced positively over the years. Almost any teacher would be proud of their record.